Idaho Smart Growth is kicking off a new tradition leading up to the Grow Smart Awards! 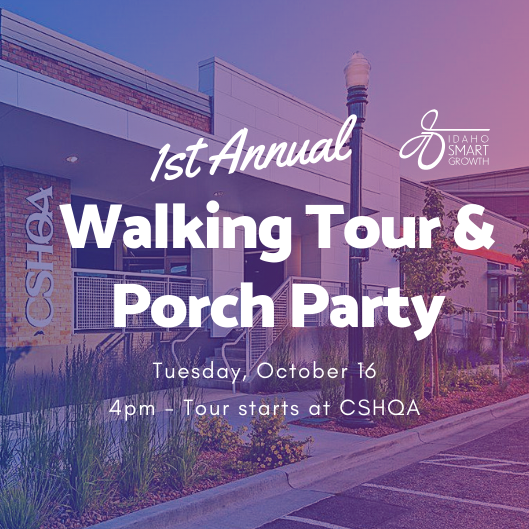 Join us on October 16 for a walking tour of prior Grow Smart Award recipients in downtown Boise. It’s your chance to see smart growth principles in action! We’ll end the tour with a social hour at the CSHQA front porch. The Porch Party will be our official announcement of this year’s Grow Smart Awards. Be one of the first to know! 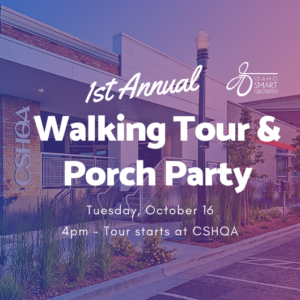 Walking Tour starts at CSHQA at 4:00 PM. Porch Party is from 5 – 6:30 PM. Join us for food and drink and the official announcement of the 2018 Grow Smart Award winners! Reservations are required. Tour is limited to the first 30 people. Porch party open to all! Click here for more information about the Grow Smart Award program. Registration is now open to attend this year’s Grow Smart Awards! Register here. 2018 Grow Smart Awards Nominations are Open! Idaho Smart Growth (ISG) is now seeking nominations for the 2018 Grow Smart Awards. (Click here for nomination instructions and here for the required cover letter.) ISG has presented the annual Grow Smart Awards since 2005 to celebrate planning and development efforts around Idaho that exhibit outstanding implementation of smart growth principles. Nominations can be for buildings, plans, open spaces, studies, organizations and any other example of smart growth in action. Anyone can submit nominations, for projects of all types and sizes, from any year and from throughout the state. Awards are selected by a jury of professionals knowledgeable about smart growth principles. Application deadline is midnight on June 4. We encourage anyone interested in nominating a project to get in touch with ISG staff soon—we can answer questions and offer suggestions to help make applications more effective. Contact us with any questions at 208-333-8066 or office@idahosmartgrowth.org. More information on the Grow Smart Awards program is available here.